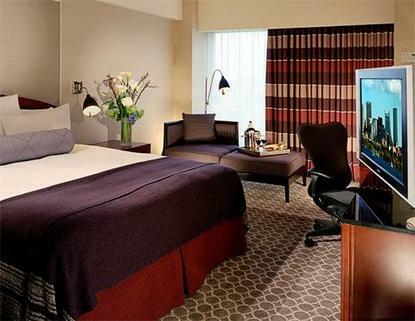 After landing in Boston, stay at the Four Star and newly-renovated Hilton Boston Logan Airport hotel, the only first class hotel in the city with direct connection to the terminals at Boston's Logan International Airport. You can walk to the Hilton hotel via skybridge or, if you'd prefer, take a complimentary shuttle. But don't stop there. We also offer complimentary shuttle service to the subway and water taxis so you can experience all the excitement of downtown Boston and Cambridge - just minutes away.We've just completed our 7.2 million dollar room renovation which features sound-proof guest rooms and suites including 75 Executive Level rooms. Most of our rooms feature magnificent views of Boston's skyline or the Boston Harbor. Each room is complete with superior amenities, including wireless high-speed Internet access. Lift your spirits in one of our great restaurants or lounges. Choose from a wide variety of local flavors, mixed with a Californian Coastal influence to create a savory experience in Berkshires. Or, for a more relaxed atmosphere, try a taste of Boston in Connolly's Pub, where you can kick back and enjoy your favorite traditional New England food and spirits. We also invite you to sample your favorite coffee drink and light fare at Cafe Presto, our specialty coffee bar serving Starbucks Coffee(reg). Begin or end your day unwinding at the Health Club and Spa. Work with state-of-the-art exercise equipment, take a refreshing swim in the pool, lounge in the whirlpool, or indulge with a relaxing massage.The Hilton Boston Logan Airport hotel is also the perfect location for your next meeting, conference, reception or special event, with 30,000 square feet of versatile meeting rooms and ballroom space. Our attention to detail and warm, welcoming staff make us the perfect Boston location for all your needs. We will gladly assist with transportation and sightseeing plans for all of our area's favorite sites -- from Fenway Park to Faneuil Hall, Boston Common to Chinatown. So whether you're in town for business or leisure, the Hilton Boston Logan Airport promises you a richly rewarding stayTravel should take you places.